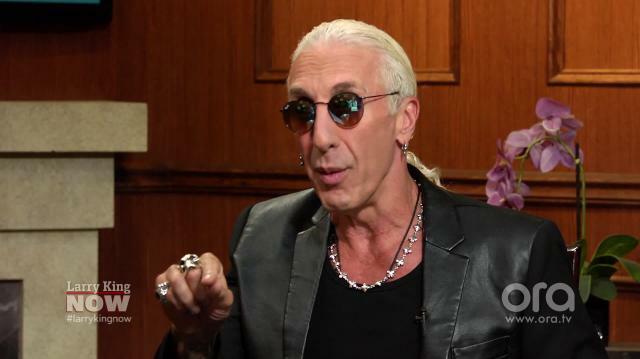 After he asked Donald Trump to refrain from using hit Twisted Sister song, 'We're Not Gonna Take It,' Dee Snider updates Larry on whether or not the two remain friends and comments on Trump's White House bid. Will Twisted Sister continue touring after 2016? What artist is Dee Snider dying to work with? Larry King: All right, Donald Trump. We’ve gotta bring him up. Larry King: You were on his show? Dee Snider: For almost – for three seasons. Larry King: For three seasons. Dee Snider: Yeah. In various ways, yes. Larry King: So how do they keep carrying you over? Larry King: You’re a friend of Donald’s? Dee Snider: Yes, I’d like to say I am. Larry King: I’ve known him a long time too. What do you make of this Donald Trump? Dee Snider: Of- oh I thought you were going to show me something on a page. ‘This is breaking news.’ You know what? Larry King: Everything’s breaking news. Dee Snider: You know, and you know this Larry. When you have dinner, when you have drinks, when you socialize, you don’t talk about politics. You don’t talk about religion. I don’t know about you. And you don’t talk about sports. Those are the big three. Larry King: No, I talk sports. Dee Snider: You talk sports, okay. You know even that can sometimes break a friendship up when you get into some certain teams. So I mean we socialized, we got along great, we like each other. But these things when he now speaks his opinions, they’re very different from my belief system. Larry King: Have you spoken to him about it? Larry King: Did you ask him to stop playing it? Larry King: What did he say? Dee Snider: He said, ‘okay.’ And again, that’s a class act. To ask permission, which nobody does, and then when asked to stop and I explained why he stopped that night. He never used it again. Larry King: Do you think the real Donald is anti-gay, anti-abortion? Anti-um… Pro-the second amendment? Do you think that’s the real Donald? Dee Snider: I absolutely do not. I absolutely don’t. I mean I’m pro-second amendment, I’m pro-women’s right to choose, a lot of these philosophies… I mean, he was a Democrat to a few years back. He was a New York guy. Larry King: He wanted a single-payer healthcare system. Dee Snider: I don’t… You know, I don’t know what’s going on. Larry King: Are you voting for Hillary? Dee Snider: I absolutely am. And again it’s one of those elections of, these were our choices. You either don’t use our amazing right to vote and not vote at all, which I think is a mistake, or you pick one and you go with it. Larry King: Watch new episodes of ‘Larry King Now’ Monday, Wednesday, and Friday on demand on Ora TV, and Hulu.